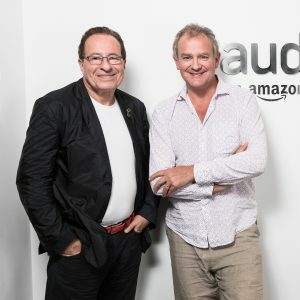 Pan Macmillan are excited to announce that the audiobook for publishing phenomenon Peter James’ upcoming thriller Absolute Proof will be voiced by Downton Abbey star, Hugh Bonneville. Inspired by an unforgettable, real-life phone call received by the author nearly 30 years ago, Absolute Proof is a breathless race against time to solve the greatest mystery of all: absolute proof of the existence of God. With 13 Sunday Times number one bestsellers and 19 million copies of his books sold worldwide, Absolute Proof marks a major milestone for Peter James, as his most epic and ambitious stand-alone thriller to date. Peter James and Hugh Bonneville first met in 2008 when they discussed the possibility of Bonneville playing James’s character Detective Superintendent Grace in a TV adaptation. Although the adaptation did not move forward, the two have remained close friends. The audiobook will be their first official collaboration. Hugh Bonneville is no stranger to the topic of religion, holding a theology degree from Cambridge University where he was taught by the former Archbishop of Canterbury, Rowan Williams. Earlier this year, Bonneville presented the standalone documentary Jesus: Countdown to Calvary, a historical examination of the events leading up to the execution of Jesus of Nazareth by the Roman government. The audiobook for Absolute Proof was recorded in partnership with Audible, who will be releasing it as an audio first exclusive in the US in October. This autumn, to mark the publication of his highly-anticipated new book, 21 Lessons for the 21st Century, global phenomenon Prof. Yuval Noah Harari will discuss the most urgent issues of our times at a special how to: Academy event in London on Thursday 27th September. Harari will be joined in conversation by award-winning actress, director, activist and Harvard graduate Natalie Portman, who is one of a number of high-profile figures who have read and recommended Harari’s books in the past – alongside the likes of Barack Obama, Mark Zuckerberg and Bill Gates. Portman has also studied at the Hebrew University in Jerusalem where Harari now teaches. 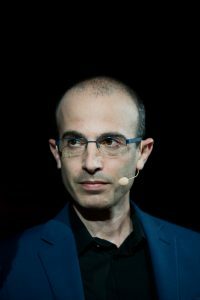 The event will see over 2,300 readers and fans come together at Central Hall Westminster to hear Harari expand on some of the arguments he presents in 21 Lessons for the 21st Century, as well as Portman’s own thoughts and experiences as an activist and humanitarian. Published on 30th August by Jonathan Cape, the book’s easily-digestible chapters tackle a number of contemporary issues, both personal and global; ranging from Brexit, fake news and the future of welfare, to mental stability, ecological cataclysm and technological disruptions. Over the evening Harari will turn his attention to some of the most provocative and insightful questions he poses in the book, and how we can all find our focus in this increasingly complicated 21st century world. Tickets for the event will go on sale on Friday 13th July and will be available from www.howtoacademy.com. The event forms part of a programme run by how to: Academy featuring leading scientists, business theorists, Nobel Prize laureates, philosophers and authors. Specialist culture and entertainment PR agency Riot Communications has appointed Alison Clarke as a Board Advisor as the agency continues to grow. Clarke, who recently won the PRCA’s most prestigious award – Mark Mellor Outstanding Contribution to the PR Industry – has long been a champion of Riot, most recently mentoring Riot Director, Adele Minchin, as part of the PRCA / PR Week Fast Track Mentoring scheme. Clarke brings to Riot 25 years of experience having led Weber Shandwick’s Asia Pacific office, and heading Hunsworth PLC’s Business Development, before taking the helm at Grayling UK and Ireland. Clarke now runs her own consultancy business. Clarke will begin working with Riot this month.